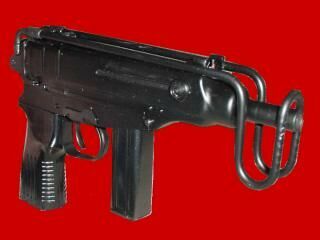 Czech Skorpion in .380 ACP - compact and light and only slightly larger and heavier than the weaker .32 ACP version. This short 12-round magazine is compact, but is replaced with 30-round variants when concealment is not required. Note how the magazines on the .380 Skorpions (and 9mm Luger model for that matter) are straight and not curved like the .32s.